Architectural Engineering (ArchE) deals with integrated design, construction and operation of buildings. It includes all engineering aspects related to the built environment: building envelope, mechanical systems (HVAC), electrical systems, lighting systems, construction, indoor environmental quality and human comfort- and is therefore related to multi-disciplinary research and education. Buildings in the U.S. account for more than one third of the total energy use and associated Greenhouse Gas Emissions. With increasing concern about climate change and energy prices, Architectural Engineers have a critical task for the following decades. In Civil Engineering's Architectural Engineering area of emphasis, students have the opportunity to study the integration of different building systems and to learn how to design for sustainability and energy efficiency. The area of emphasis provides flexibility and offers several courses on energy and buildings, design of electrical/mechanical systems, lighting systems, as well as on building envelope, building controls, renewable energy sources, indoor air quality and energy modeling. A minor in Architectural Engineering is also available to all students in the College of Engineering except students in the School of Civil Engineering. The faculty members of Architectural Engineering are dedicated to research and teaching, with focus on Building Science and design/operation of energy-efficient buildings. Specific topics of research include: thermal and visual comfort, indoor air quality and ventilation, innovative building envelopes, daylighting and electric lighting design & control, energy-efficient equipment, HVAC system design and control, smart buildings, passive/active solar energy technologies, building energy modeling and simulation, and sustainable/green building design. Architectural Engineering faculty are associated with the Ray W. Herrick Labs. Together with the HVAC Group in ME, we have one of the largest teams in the US conducting research related to the built environment. The Architectural Engineering group has unique, state-of-the-art facilities to study building performance in terms of energy and indoor environmental quality. These include several room-scale facilities at the Architectural Engineering Laboratories, located at the Bowen Lab, as well as whole building-scale facilities at the Center for High Performance Buildings, located in Herrick Labs. 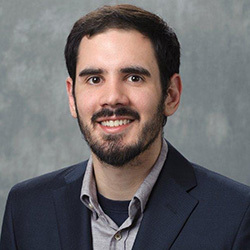 Brandon Boor, Assistant Professor in the Lyles School of Civil Engineering, is the recipient of a CAREER Award from the National Science Foundation (NSF) for his research into the formation, growth, and phase state of organic nanoaerosols in indoor environments. 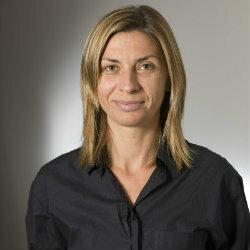 Professor Panagiota Karava has been appointed as the Jack and Kay Hockema Associate Professor in Civil Engineering. This is the first "Rising Star" professorship designed to recognize faculty members in the early stages of their career. Iason Konstantzos (Ph.D. ’16) started as a tenure-track assistant professor in the Durham School of Architectural Engineering and Construction at the University of Nebraska-Lincoln on Aug. 13, 2018. 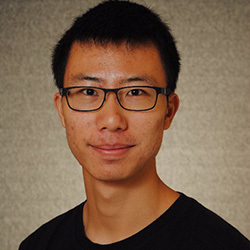 Civil Engineering Ph.D. student Tianren Wu was recently named recipient of the prestigious ASHRAE Grant-in-Aid Award for 2018-2019. This $10,000 award is given to the most outstanding graduate students performing research in the High Performance Buildings or HVAC fields. The American Society of Heating, Refrigeration and Air-Conditioning Engineers considers applications from all over the world. NSF announces $3.6M to a multidisciplinary Purdue team as one of the first-ever awards through the Smart & Connected Communities program seeking to address transportation, infrastructure, health and other rural and urban challenges. 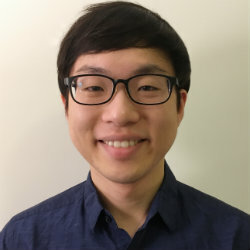 PhD student Seungjae Lee was recently named recipient of the prestigious American Society of Heating, Refrigeration and Air-Conditioning Engineers (ASHRAE) Grant-in-Aid Award for 2017-2018. This $10,000 award is given to the most outstanding graduate students performing research in the High Performance Buildings or HVAC fields. As the world swelters toward a third straight year of record-breaking heat, experts in air conditioning and refrigeration are chilling out during three international conferences this month at Purdue University. 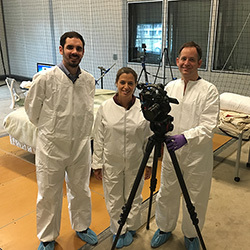 CNN's Senior Medical Correspondent, Elizabeth Cohen, visited Purdue's Herrick Labs in April to film a segment about the indoor air quality of bedding materials with Assistant Professor Brandon Boor. Associate Professor Panagiota Karava is leading a multi-disciplinary Purdue team that has been awarded a $1.2M National Science Foundation grant for their project "CyberSEES -Type 2: Human-centered systems for cyber-enabled sustainable buildings." Grissom Controls, which offers a software solution to optimize controls for highly complex heating, cooling and ventilation systems in buildings, took top honors and $5,000 at the fifth Schurz Innovation Challenge at Purdue on Thursday (April 30). 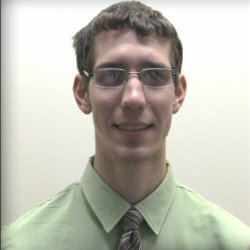 Andrew Martin, the sole member of Grissom Controls, is a student in Purdue's Lyles School of Civil Engineering. 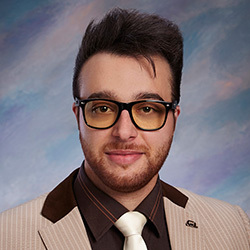 Civil Engineering PhD students Iason Konstantzos (advised by Thanos Tzempelikos) and Jaewan Joe (advised by Panagiota Karava) were named recipients of the prestigious ASHRAE Grant-in-Aid Award for 2015. Siwei Li, a recent Ph.D. graduate in civil engineering, has been awarded the 2014 Chorafas Foundation Award in recognition of her work titled "Modeling of Photovoltaic Thermal Systems with Transpired Solar Collectors Integrated in Building Operation Simulations." performed under the supervision of Panagiota Karava, assistant professor of civil engineering and construction engineering management. Professors Thanos Tzempelikos, Panagiota Karava and Jim Braun from CE, together with Prof. Patricia Davies (ME) and Prof. Robert Proctor (PSYCH) formed a Purdue team that received one of the six grants awarded from the new Pillars of Sustainable Education program. Assistant Professor Ming Qu served on the solar application jury at the Solar Decathlon China, co-hosted by the National Energy Administration of China and U.S. Department of Energy. 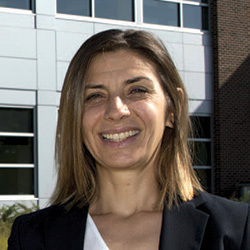 Panagiota Karava, assistant professor of civil engineering, is among the Purdue researchers exploring ways to significantly reduce energy consumption by incorporating innovative strategies into the design and operation of new buildings, optimally linked with smart grids. Congratulations to Prof. Karava for receiving the 2013 New Investigator Award from the American Society of Heating, Refrigerating and Air Conditioning Engineers (ASHRAE).